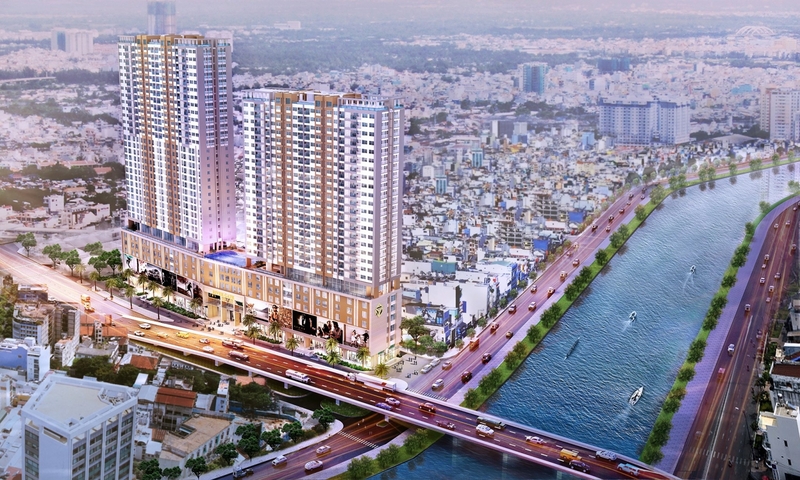 In the development plan for the city, District 4 will be a broadening center of Ho Chi Minh on an area of 930 hectares. This place will be a booming area of civil-commercial-industrial purposes that stands for the podium of development of regional center. In the history, District 4 is a deserted place that is separated by channel and rivers. District started to change its face and wore a new dress. People moved to District 4 and change it every day. 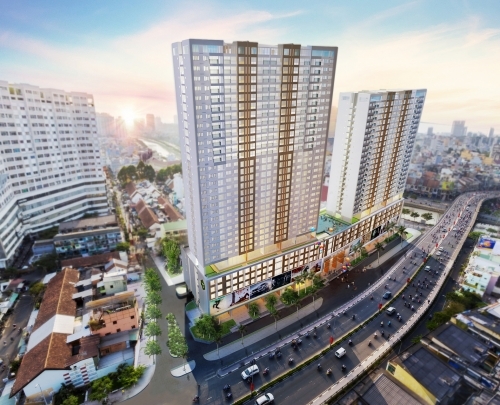 Gradually, many commercial centers are set up and built mostly besides Saigon River, on Nguyen Tat Thanh and Hoang Dieu Street to an intended public center at Ward 1. Nowadays, District 4 is absolutely changed to be an expanding center of Ho Chi Minh City with very high quality infrastructures: commercial centers, international tourist harbor. On a privilege location, being next to business center and Ben Nghe River, District 4 is a potential place for you to buy or invest in real estate products, especial at the present. 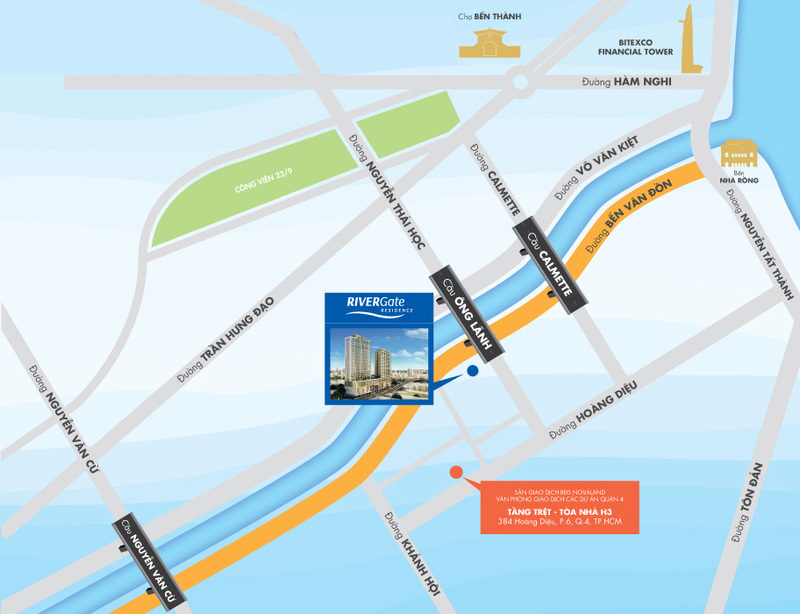 River Gate Apartment is located at 151 Ben Van Don Avenue, District 4. River Gate is one of the most extremely good apartment in District 4. It is located in frontage of Ben Van Don Street, at the foot of Ong Lanh Bridge, parallel to Vo Van Kiet Avenue, only 200 meters to reach commercial and financial center of Ho Chi Minh City. In the near future, when the Ben Thanh – Suoi Tien subway is going to completion stage, from River Gate apartment, you can easily go to the Eastern area of Ho Chi Minh City. - From River Gate apartment to District 1 approximately 200meters. - Far from Ben Thanh market 500 meters. - From River Gate Apartment, you can easily go to District 5, District 10 and District 2 by Vo Van Kien Avenue. - You can also quickly go to District 7, 8, Binh Chanh and Nha Be District. 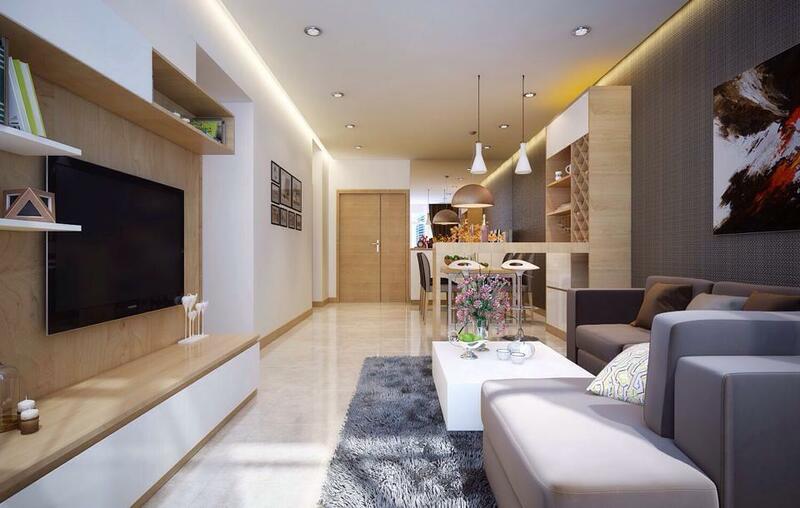 River Gate Apartment consists of two buildings from 27 to 33 high floors which area varies from 56.80sqm to 114.24sqm. 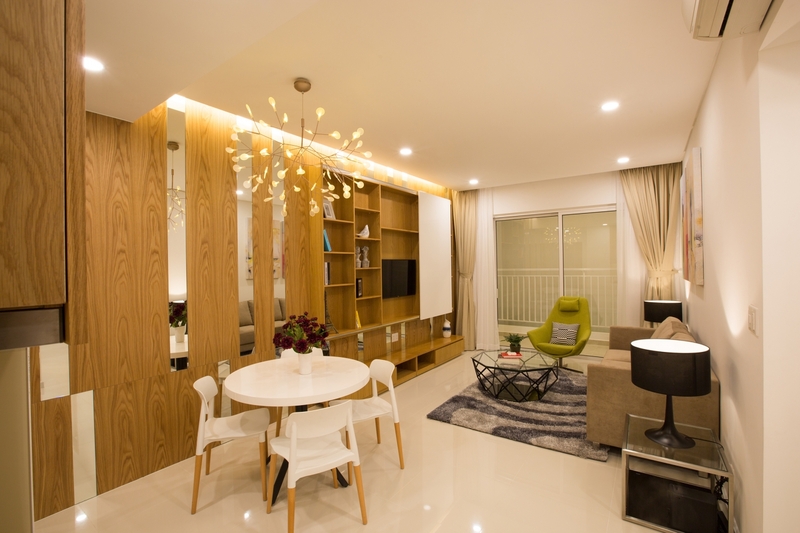 After finish, River Gate Apartment is a symbol of beauty, harmony, grace and elegance beside Saigon River. All apartments hear are designed in open-air style in harmony with at least two surfaces exposed to river space. Type of properties: Complex buildings of apartment-commercial and offices. River Gate Structure: project includes 5 sub-stair, 6 floors of commercial offices, 7th floor especial for all of conveniences and services for residents, and the rest are apartment from 27 to 33 floors in 2 block of buildings. 6 foot floors: 3 floors for commercial offices and 3 floors of office-tel + commercial. 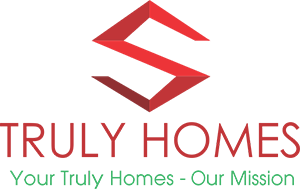 River Gate apartment designed in luxurious and modern way is a most high quality residence project in central region that Novaland is developing now. The project is a harmonious combination between offices, commercial centers and apartment into a perfect unity. River Gate District 4 apartment provide the best conditions for a comfortable luxury living. With a combination of apartment and office for rent, commercial center, luxury apartments. River Gate's price is reasonable for luxury apartments that many customers are interested in and want to own. River Gate Project is fully furnished with advanced facilities to serve the best life for all the residents living here. Customers can meet all the needs of daily living with designed services such as swimming pools, commercial shopping center, spa, gym,cafe, restaurant and many other high-end gadgets. 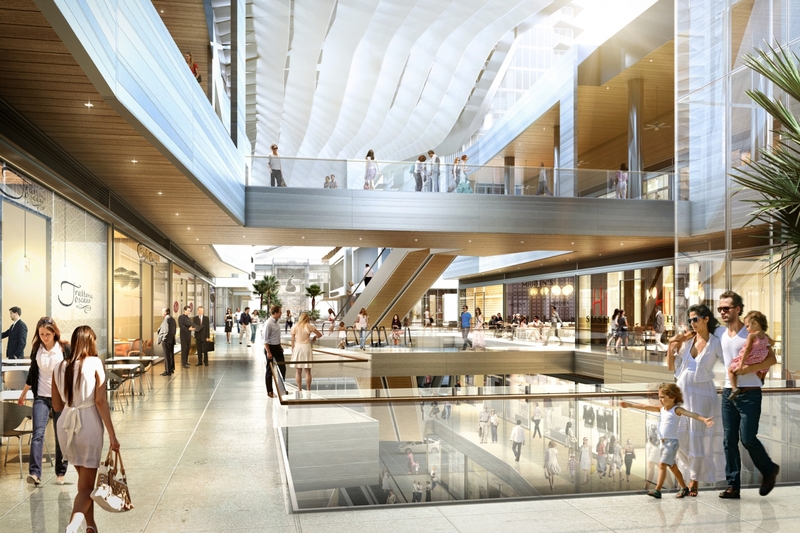 Shopping mall in River Gate apartment is model of wholesale and retail business model which meet the various shopping needs of almost people with a reasonable price. Opening, large in width hall facilitate the selection of favorite products of customers. Every shop in River Gate aims to diverse products for variety of customers demand. For parking? Don’t worry, you will have very big place to park your car, even the big car. Then you can go to have a rest, even after long shopping time, in food, café area. That is a truly value of a commercial center that differs. Officetel is a new model of property product, is expected to attract more investors from the market. 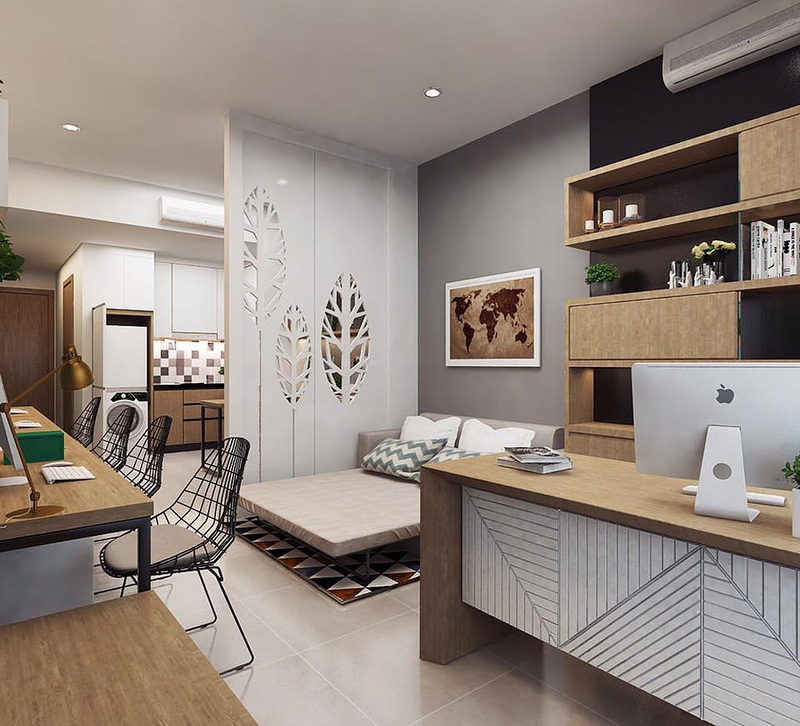 This model is a combination of Office and Hotel, which means that the owner has the right to both business and residence registration for his apartment Officetel. This model is attracting the attention of the market and expected to grow significantly in the coming years. Come to River Gate apartment, customers is hardly ignore the new model of Officetel on the area from 26 to 31sqm, this is the first investment options for those who prefer to buy an apartment for rent. You can design a one-bedroom apartment for staying and working. 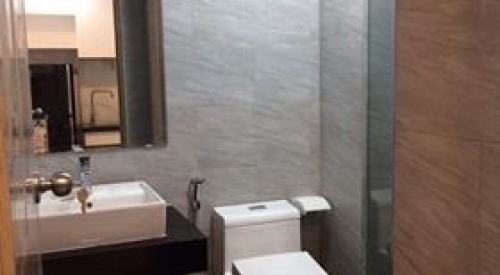 This type officetel of River Gate apartment is suitable for singles for its affordable rental rate and have sufficient utility to use, such as swimming pool, gym, shopping and dining area. You will attract big intention and have a big chance to rent you apartment out.